As your recently elected President, I am honored and grateful to lead this organization forward with its long history of supporting the Virginia orthopaedist in what they need to practice their best. We had a great meeting in Roanoke where I took over the gavel from John Mann, who took our organization through the last year with a major victory on workers' compensation and other issues. I mentioned at the meeting that my late father, Joseph Romness, was President for the 1981 meeting in Williamsburg. I forgot to mention that my brother, David Romness, was also President for the 2000 meeting in Norfolk and is currently one of our State Representatives to the Board of Councilors (BOC) as well as current President of the Eastern Orthopaedic Society (EOA). David and I proudly and humbly follow the excellent support my father gave to Orthopaedics with his membership on the VOS, EOA and the American Academy of Orthopaedic Surgeons (AAOS) Boards of Directors. I have learned through my involvement with the VOS that our major functions focus on state legislative and educational activities. Many of the laws and regulations that affect the physician on a daily basis are at the state level; hence the importance and impact our organization can make for the Orthopaedic Surgeon. As an example, seven years ago the VOS was represented by Wilford Gibson, David Diduch, and Jody Smith on the Direct Access Advisory Committee that addressed direct patient access to Physical Therapists. The outcome included a seven year moratorium on the topic that has passed. We have now begun initial discussions with the Virginia Physical Therapist Association who are looking to expand their scope. Another topic that is active this year is certification for ultrasound use. Some payors have denied covering the fee for ultrasound assisted injections and are trying to require accreditation for the use of ultrasound. Use of ultrasound is a valuable aspect of many Orthopaedists' (and other physicians') practice that the VOS will work to defend. VOS is not only state focused, but we are also your link to the political actions of the AAOS. 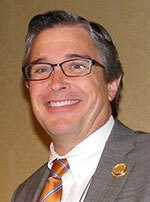 The VOS nominates the State Representatives to the AAOS Board of Councilors (BOC). The BOC is considered the grassroots of the orthopaedic profession and serves as an advisory body to the AAOS Board of Directors and a resource to AAOS committees. So you have a voice nationally as well. As political action is a major focus of the VOS and the driver for that action is lobbying, I encourage all Orthopaedists in the state to contribute to the VOS government relations and public affairs organization, ORTHO PAC, by donating at https://secure.societyhq.com/vos/OrthoPAC.iphtml. We have 100% of the Board contributing, but should have 100% of the Virginia orthopaedists. See chart below. From an educational standpoint, the Annual Meeting is an excellent source of local Continuing Medical Educational (CME) credits without the hassle of air travel. The educational component comes from the lectures, the posters and interaction with peers and the exhibitors. Even though I am a Pediatric Orthopaedist, I still learn from the other subspecialties of Orthopaedics and appreciate the interaction I get from face-to-face time with others across the State. It is especially fun to see people from year to year and catch up on the news from their practice. For next year’s meeting, we return to a renovated Omni Homestead April 24 – 26, 2015. I have recruited James Browne from UVA and Varatharaj Mounasamy from VCU as Program Co-Chairs. I would like to welcome all those who are involved with the orthopaedic care of patients in Virginia to participate in this organization and come to the meeting. We have participation by practicing physicians, resident physicians, nurse practitioners and physician assistants, all focused on orthopaedics. Please join us. I look forward to the year ahead and will do my best to represent orthopaedic interests in the Commonwealth of Virginia as well as nationally. We have a well run and financially sound organization that can be an effective entity for its members.